Dropping you a message @MrMedia. Coming through in the next 24 hours! I want to add a couple of quick comments regarding my experience with @LetterCraft. I have placed a couple of orders for content with these folks and the writers have done an admirable job both in terms of performing the research necessary to prepare each piece and in drafting the content. First, my niche is highly technical in nature, necessitating research by the writers (which the writers have clearly performed in order to draft the content I ordered). Second, the content LetterCraft has produced to date reads well and is devoid of any discernible grammatical errors. Third, the content is unique and has passed Copyscape's premium search. Fourth, the content is reasonably priced. Placed an order & sent you a PM! On it! Dropped you a message and an email. Placed an order and sent you a message on gmail. Let's get it rolling. Do you have experience writing content for local businesses as well? Location+service pages written to rank well? Just placed a test order, been meaning to check you guys out for bulk work. Very pleased with the content you guys just delivered. I left several messages on email. No response. Have you recieved the instructions? What's the tat. Looks like your emails have been going to spam. Just whitelisted you and dropped you an email. We have a HUGE Cyber Monday deal specially for you guys! There are only 2 of these available. 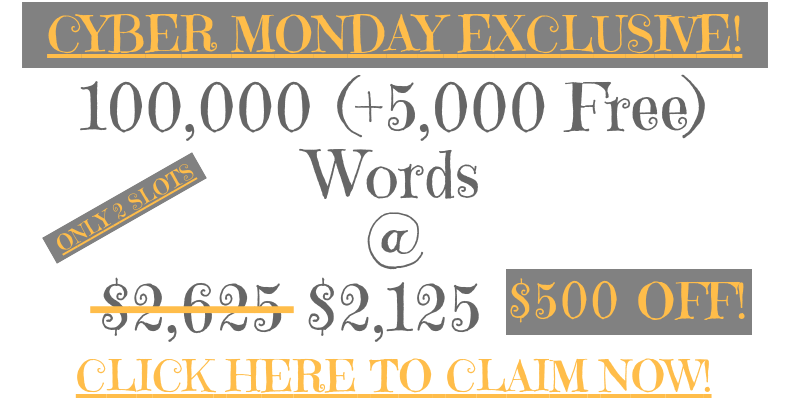 You get an epic deal on our already discounted prices (105,000 words @ $2,125). Grab them before they get sold out (please read the note below prior to placing your order)! LetterCraft Inc. will be pausing deliveries between 15th December and 3rd January. Our Craftsmen will continue to work on your content in the background and deliveries will resume from the 1st week of Jan. Wishing you all a wonderful Christmas and New Year in advance! Those who grab the Cyber Monday deal will have 15-20k words of their order delivered before 15th December and the rest from the 1st week of January onwards. We've got some new Crafters on board and some additional bandwidth in place. Order away! P.S. We have an unadvertised deal for orders over 50,000 words. Write in if you're interested! Oh wow! Didn't even see that last post before my order for 50,000. Thanks for including it in on my order! Hey mate, any news about my order? I have no confirmation from you guys that the order has been recived. Can you please update me? We had discussed this over email earlier, forgot to drop a response on the thread. Glad to have you back again! We have some additional bandwidth in place starting next week and have another slot available for recurring weekly deliveries of 15-20k words/week that a lot of you have been asking for! Don't forget to write in if you're looking for the unadvertised 50,000-word package.